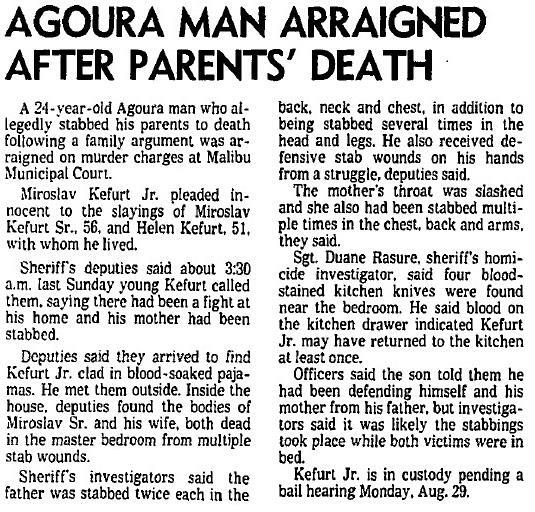 Dec. 17, 2014 -- A few hours before dawn on Sunday, Aug. 21, 1977, Miroslav Kefurt Jr., 24, called police and asked them to come to his home on Driver Avenue in Agoura, about 30 miles west of Los Angeles, where he lived with his parents. There had been a fight inside the home, Kefurt told police, and his parents, Miroslav Kefurt Sr., 56, and Helena Kerfurt, 51, had been stabbed. The Kefurts were all born in Czechoslovakia, and came to the United States in the late 1960s. Kefurt Sr. was a popular and successful composer, musician and bandleader in his home country, and had performed on several albums as a guitarist in the late 1950s and early 1960s. Kefurt Sr. also organized an instrumental group known as Miroslav Kefurt and His Rhythmic Group, which was one of the pioneers of instrumental rock and surf music in Czechoslovakia. Kefurt Sr.’s guitar style has been compared to Les Paul. After arriving in the United States, Kefurt Sr. found work as a guitar instructor and a session player in Los Angeles. Kefurt Jr. worked in an auto repair shop. Neighbors described the family as quiet and industrious. When sheriff’s deputies arrived at the Kefurt home, they found Kefurt Jr. standing outside, wearing torn and blood-soaked pajamas. His parents were both inside, dead in the master bedroom. Kefurt Sr. had been stabbed in the head, neck, back, chest and legs, and he bled to death. He also had defensive wounds on his hands, indicating a struggle. Helena Kefurt was on the bed. Her throat had been slashed, and she had numerous stab wounds to her chest, back and arms. She died after the knife sliced into her aorta, the main artery from the heart. Kefurt Jr.'s only injury was a small cut on the palm of his left hand. Kefurt Jr. told police that he heard his mother scream, and rushed to the master bedroom. There, he saw his mother on the bed with stab wounds, and assumed that she was dead. Standing over her was his father, holding a knife in each hand. According to Kefurt Jr., his father lunged at him, and they struggled for the knives. Kefurt Jr. said he gained control of one of the knives and stabbed his father several times, until the blade broke. He then ran down the hallway to the kitchen, grabbed two more knives, and returned to the master bedroom, where he stabbed his father until he fell to the floor. Kefurt Jr. told police, "I didn't mean to kill my father; I only meant to beat him up." Police found four blood-stained kitchen knives near the bedroom, and blood in a kitchen drawer, which indicated that Kefurt Jr. had returned to the kitchen at least once during the struggle to retrieve another knife. Investigators also said that it appeared that both victims had been stabbed while they were in bed. The amount of blood throughout the house prompted one of the first sheriff’s deputies on the scene to describe it as "Manson-like." But the L.A. County District Attorney's Office didn’t believe Kefurt Jr.'s story. He was charged with two counts of first-degree murder, and prosecutors planned to seek the death penalty. A key piece of evidence was the fact that Kefurt Jr. had purchased two of the knives and a knife sharpener in Studio City the day before his parents were killed, which could indicate premeditation. The receipt for the purchase was found in Kefurt Jr.'s wallet. Prosecutors, however, were unable to determine a motive for the crimes. They were further confused when Kefurt Jr. entered a plea of not guilty by reason of "temporary insanity and lunacy" to both murder charges. Since Kefurt Jr. had claimed that his father had killed his mother, and he had killed his father, they assumed that he would enter an unembellished plea of not guilty, at least in his mother’s death. Kefurt Jr. was released on $40,000 bail, and he moved to Sun Valley, where he continued to work in the automobile repair business. Like the District Attorney's Office, neighbors who knew the family had more questions than answers. They couldn't believe that Kefurt Jr. could have planned and viciously killed his parents while they slept, but they also couldn't believe that Kefurt Sr. could have killed his wife, then attacked his son. "If you threw a rock at him (Kefurt Sr.)," one neighbor said, "he'd only ask you why." After several lengthy delays, Kefurt Jr.’s trial started in December 1980, more than three years after the killings. After a two-week trial and six days of deliberations, the jury reported to the judge that they were hopelessly deadlocked, with a vote of 10-2 in favor of acquittal, and a mistrial was declared. 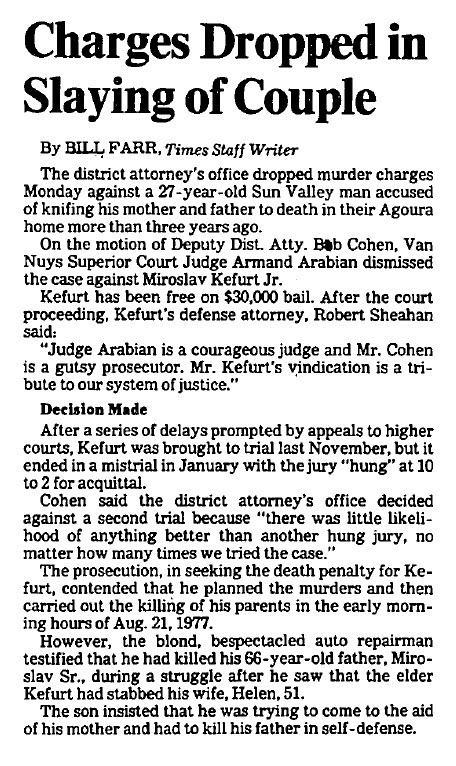 The District Attorney’s Office decided against another trial, and dropped the charges against Kefurt Jr. in March 1981. "There was little likelihood of anything better than another hung jury, no matter how many times we tried the case," said Deputy District Attorney Bob Cohen. 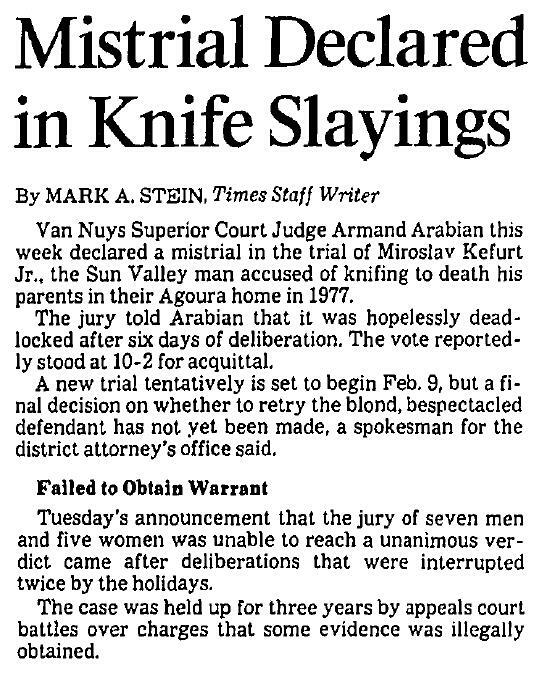 Despite the purchase of the knives, there wasn't enough evidence to prove that Kefurt Jr.'s story wasn't true. After the trial, Kefurt Jr. remained in the automobile business. 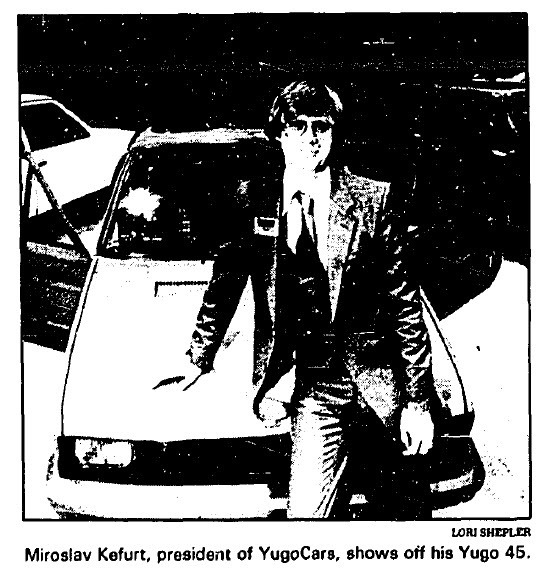 In 1982, he became the first Yugo distributor in the United States, as president of YugoCars, based in Sun Valley. The car, built in Yugoslavia, was promoted as an economical and reliable sub-compact, with a price tag of $4,000. The Yugo, however, gained a reputation as being difficult to handle, and unable to meet U.S. emission standards. After an EPA-mandated recall of more than 126,000 Yugos in the United States in the early 1990s due to a failure to meet emission requirements, plus the effects of United Nations sanctions against Yugoslavia which forced the manufacturer to end exports, Yugo sales in the United States ended in 1992. After YugoCars, Kefurt Jr. moved to Las Vegas, where he is currently CEO of a company that conducts automotive market research and develops marketing strategies for automotive equipment manufacturers. Miroslav Kefurt Sr. and Helena Kerfurt are buried together at Pierce Brothers Valhalla Memorial Park in North Hollywood, in the Restland Section.